Scales medium brown to nearly colorless, rarely dark brown. Styles all 2-fid (rarely, some 3-fid). Achenes medium brown, sometimes darker or paler, biconvex. 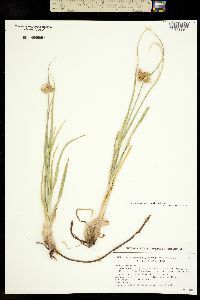 Fruiting spring-fall (south and lowland California), summer (north). 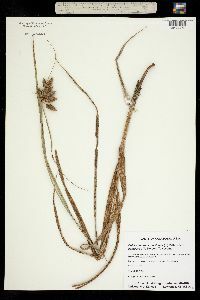 Brackish to saline coastal and inland shores, marshes; 0-2900 m; Alta., B.C., Man., N.B., N.W.T., N.S., Ont., P.E.I., Que., Sask. ; Alaska, Ariz., Calif., Colo., Conn., Idaho, Ill., Iowa, Kans., Maine, Mass., Mich., Minn., Mo., Mont., Nebr., Nev., N.H., N.J., N.Mex., N.Y., N.Dak., Okla., Oreg., R.I., S.Dak., Tex., Utah, Wash., Wyo. ; Mexico; South America (Argentina, Peru); Pacific Islands (Hawaii). 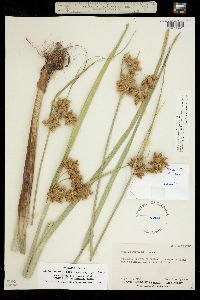 Many bipistillate specimens from Eurasia and Africa are very similar to American plants. 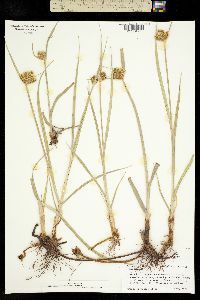 Further study may show that these plants should be included in Bolboschoenus maritimus subsp. 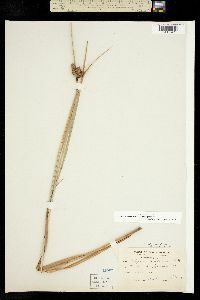 paludosus. 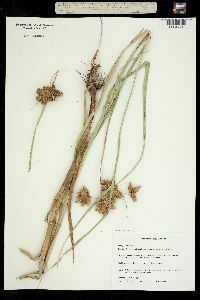 Plants from seashores have bright brown floral scales and medium to dark brown achenes; plants from the western interior have bright brown to very pale floral scales and/or achenes. 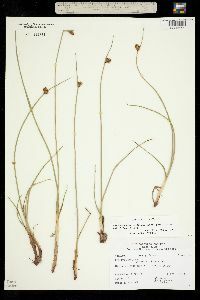 Around Chicago, Illinois, Bolboschoenus maritimus subsp. 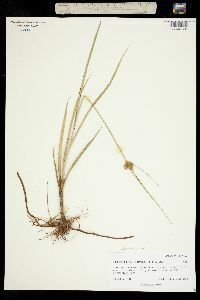 paludosus is spreading with other halophytes in roadside ditches where salts accumulate; it is likely to occur elsewhere in similar conditions. 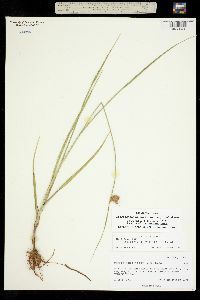 Bolboschoenus maritimus subsp. 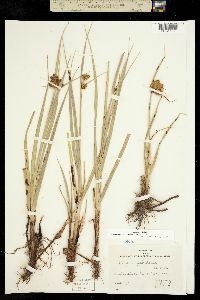 paludosus is planted for waterfowl food (H. A. George 1963, as Scirpus robustus), and in California it is sometimes mixed with B. glaucus and hybrids. 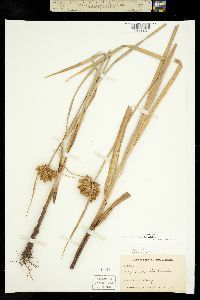 The tough inner vascular cores of the rhizomes are used by Native Americans of the Pacific Coast in making baskets. 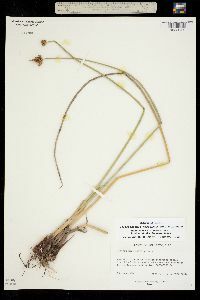 Perennial herb with tuber-bearing rhizomes 0.5 - 1.5 m tall Leaves: several, three-ranked, alternate, elongate, 2 - 12 mm wide, more or less flat, linear, parallel-veined, keeled beneath, with a sheathing base that encloses the stem (margins of the sheath fused together). Sheaths reaching more or less middle of culm, tubular with a concave or convex apex, veins diverging near apex (leaving a thin, veinless, triangular area), usually membranous at mouth. 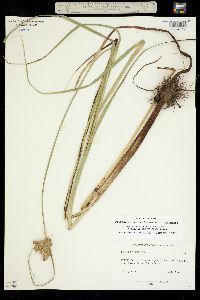 Inflorescence: composed of solitary and two- to ten-clustered spikelets, subtended by spirally arranged leaf-like bracts. Bracts (that surpass inflorescences) one to five, unequal, some elongate, to 6 mm wide. Rays (branches of inflorescence) one to four, to 8 cm long. 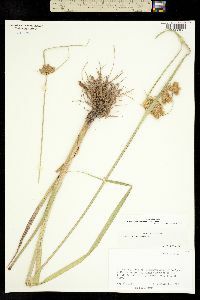 Flowers: minute, subtended by a floral scale, lacking sepals and petals, with two to six bristles. 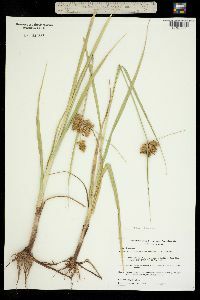 Bristles weak, brown, to half the length of the achene, deciduous. Stamens three, exserted. Anthers yellow, 2 - 4 mm long. Pistil one. Style linear, two-cleft. Fruit: a one-seeded achene, medium brown, 2.5 - 4 mm long, 2 - 3 mm wide, reverse egg-shaped with a rounded or nearly truncate (cut straight across) apex bearing a tiny beak, biconvex, glossy. 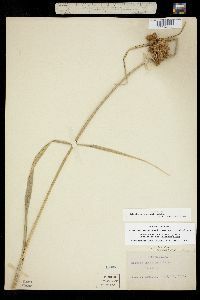 Seed with a thin, non-adherent wall. 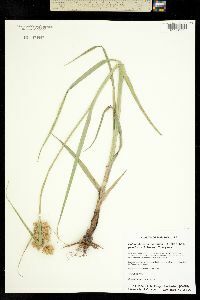 Culm: stout, 0.5 - 1.5 m long, 3 - 8 mm wide, strongly three-sided, solid, cormose at the base. 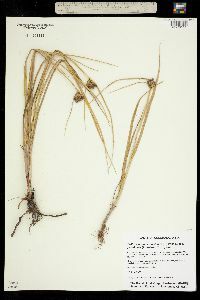 Spikelets: one to forty, most stalkless, 7 mm - 4 cm long, 7 - 10 mm wide, egg-shaped to lance-shaped with a tapering to rounded base and blunt apex, with more than 25 floral scales. Scales spirally arranged and loosely overlapping, medium brown to almost colorless, obscurely streaked-spotted, 5 - 8 mm long, 3 - 4 mm wide, minutely hairy beneath, often becoming hairless, membranous, translucent, with a notched tip bearing a stiff, 1 - 3 mm long bristle (awn). 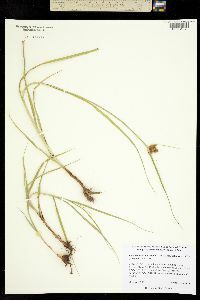 Similar species: The variety maritimus differs by having pointed spikelets and mostly three-cleft styles. 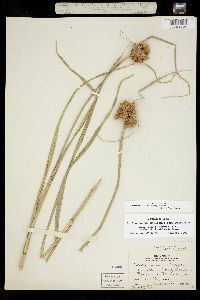 The similar Bolboschoenus fluviatilis differs by having 3.5 - 5.5 mm long, sharply three-angled achenes and flower bristles that are stout and persistent. Habitat and ecology: Some populations may have been introduced from Europe. Roadside ditches and other wet areas where salt may accumulate. Etymology: Bolboschoenus comes from the Greek words bolbos, meaning swelling or bulb, and schoenus, meaning rush, referring to the bulbous tubers which makes it different from the genus Schoenus. Maritimus means "of or from the sea." Paludosus means "of or from the swamps."